This recipe was updated 2/24/16. This creamy fall-flavored ice cream is based off of one of my favorite childhood memories: maple leaf cookies at Grandma Yoder’s house. 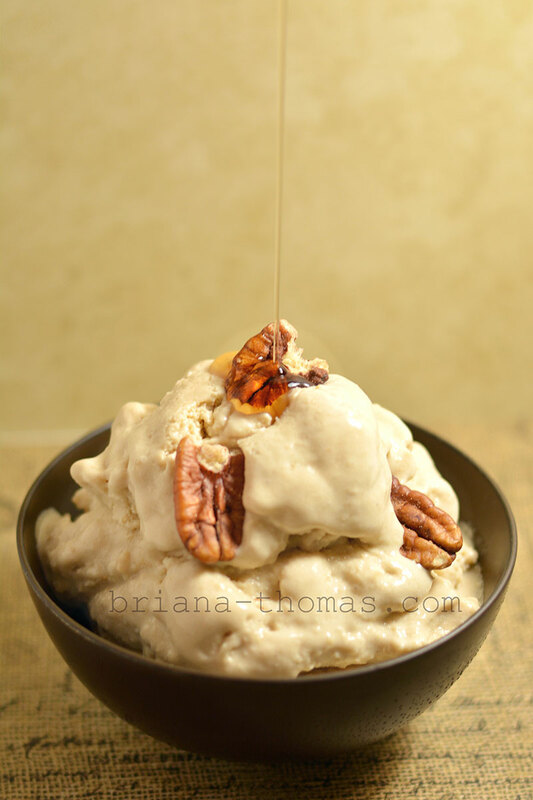 Creamy maple ice cream with cookie crumbs…and if you like, pecans and sugar-free maple syrup. With those toppings, it reminds me of a fall-flavored butter pecan. Or maple pralines. I just use store-bought sugar-free syrup (sweetened with Splenda), but if you want to make your own with a better sweetener, Gwen has a recipe for homemade syrup. Instead of making cookie crumbs, you can cut up some of my pecan pie bars into pieces and stir them into the ice cream. Delish! 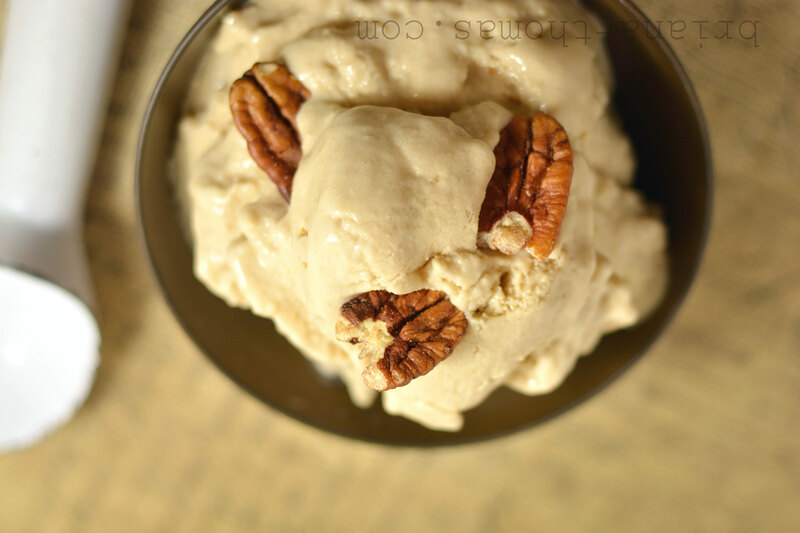 You can snag my official pin for this recipe from my THM Ice Cream Board here. Blend all the ice cream ingredients in a blender until smooth. Churn in an automatic ice cream churn according to manufacturer's directions. Meanwhile, combine all the cookie crumb ingredients, press them onto a greased metal baking sheet, and broil until lightly browned. Freeze to cool quickly. When the ice cream is done, stir in the cookie crumbs by hand and freeze the ice cream to firm up some more, if desired. Serve. If you don't have an ice cream maker, you could try freezing the blended ice cream mixture in ice trays, letting the cubes set out a bit to soften, blending them in a high-powered blender to soft-serve consistency, stirring in the cookie crumbs by hand, and freezing to the desired hardness. Instead of making cookie crumbs, you can crumble up some of my Pecan Pie Bars and stir them in instead! THM Pure Stevia Extract Powder is a low-glycemic sweetener that does a wonderful job of sweetening with a rounded flavor and no stevia aftertaste. It and THM Sweet Blend can both be purchased from the Trim Healthy Mama online store. I use this Ninja blender system and love it! We made the updated version of this (without the egg) last night. It was wonderful! It reminded me of dulce de leche ice cream, which is one of my very favorites. I was surprised how easy it was to make and mix in the cookie pieces. Thank you!! I have been making this ice cream a lot lately! It is delicious and rich tasting! I love it so much and very much appreciate your recipes! I’m so glad you like it, Allie! Thanks so much for trying the recipes! So…why imitation extract, when all your other ingredients are real? Because my mom buys the groceries and that’s what she buys because it’s cheaper. 🙂 You can gladly use the real stuff, just use a little less. We actually do have some real vanilla extract now that I’m using for all my new recipes. Hi! I love your recipes and I especially love ice cream and maple togther! Yum! Question….my daughter is allergic to dairy. What do you suggest as substitutes for the cottage cheese and heavy cream? Hi Kavita! 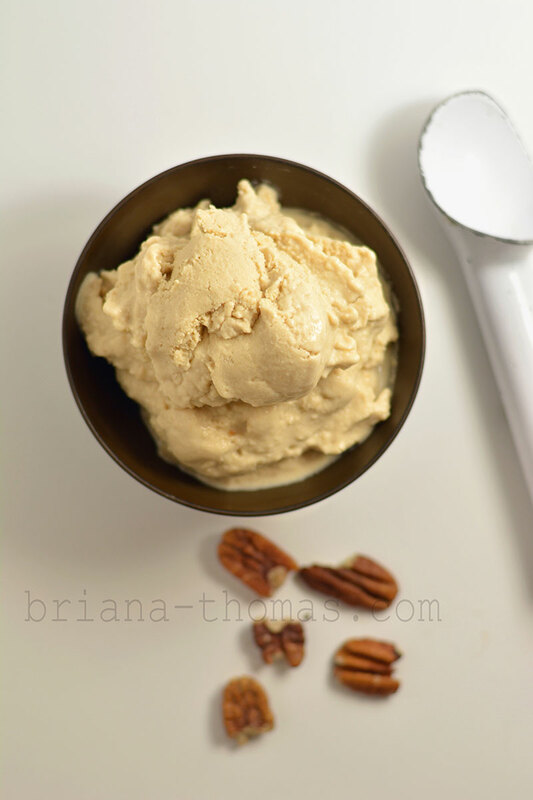 I’m afraid I haven’t been able to come up with a dairy free ice cream that I’m happy with yet, so I suggest just finding a dairy free ice cream recipe online to use as your base and tweaking it according to your dietary needs (sugar free, etc.). 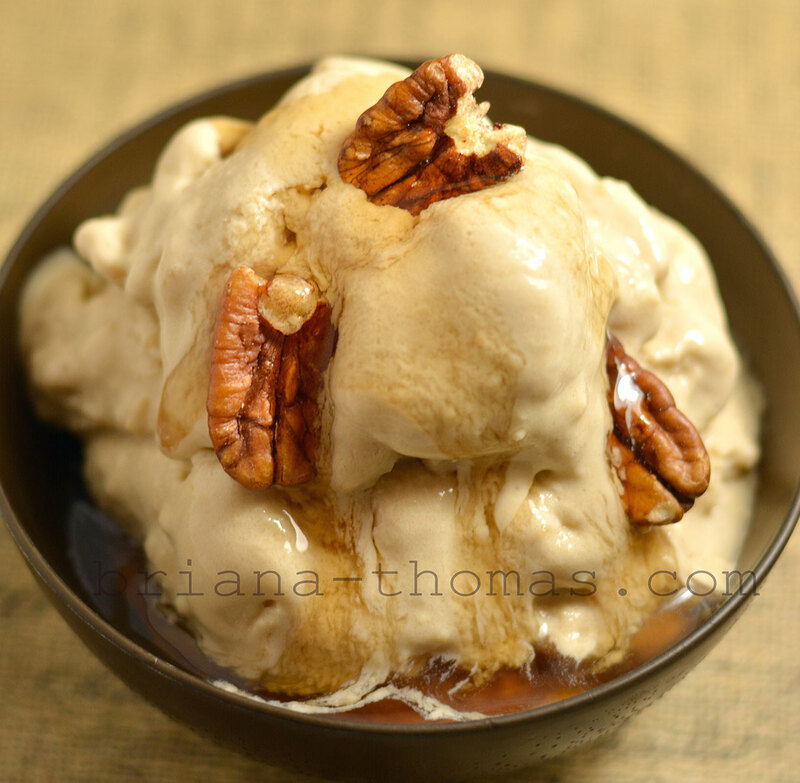 I’m working on a dairy free ice cream recipe for my upcoming cookbook. I LOVE this recipe! I don’t have an ice cream maker so I halved the ice cream recipe except kept the vanilla and maple flavoring amounts the same as the full recipe. Then I added about a cup and a half of ice and blended it on the milkshake setting on my Blendtec. The texture is great and even better if I let it freeze for 10 minutes and then stir. This makes a lot, enough for two or more servings. Thanks for posting this recipe! I’m excited to try it. I’m always confused when recipes call for cottage cheese. What kind do you recommend? Low-fat, 2%, etc? We always buy lowfat so we can use it in either S or E settings. The recipe would work with any type. Thanks! Going to the store tonight. I saw another one of your icecream recipes called for “cream.” What kind of cream do you generally mean? Is “heavy cream” ok? Sorry for the confusion; yes, heavy whipping cream is what I use in all my ice cream recipes. Great, thanks!!! Looking forward to enjoying this 🙂 I love your recipes! Really appreciate you taking the time to post them and answer questions. I just made this and it is wonderful. I didn’t have any maple extract, so I used caramel. It was really good. I will get some maple extract and use that next time-I am sure it is even better. Thank you SO much! Wow! That was quick! I’m so glad you liked it.